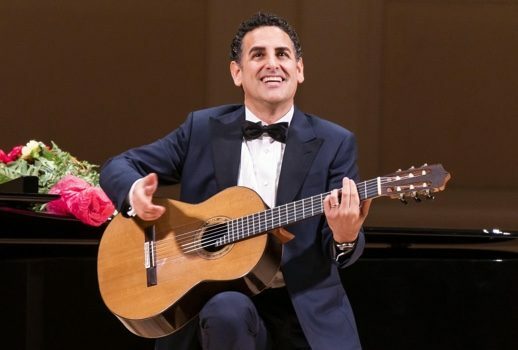 Fans of Juan Diego Flórez who have endured an inexplicable three-and-a-half year absence from New York’s operatic and concert scene found much to cheer at Sunday’s sold out Carnegie Hall recital. In the end it became a veritable love-fest between the Peruvian tenor and those assembled in the Hall. The star tenor has been dazzling the operatic world since his 1996 breakthrough debut in Pesaro as Corradino in Matilde di Shabran. Since then he has conquered most of the tenore di grazia roles of Rossini, Bellini and Donizetti. During his absence from the Metropolitan Opera, Flórezhas taken on more dramatic parts including Massenet’s des Grieux and Werther, Donizetti’s Edgardo and Offenbach’s Hoffman. On December 4, he will debut the role of Alfredo in Verdi’s La Traviata at the Met. Has the foray into heavier roles taken a toll on the tenor’s voice? I am happy to report that 22 years into his career the voice remains remarkably fresh and unmarred by any serious vocal distress. In many ways his current career path mirrors that of the great Spanish tenor Alfredo Kraus. Indeed Kraus would have been completely at home with Flórez’s somewhat uninspired program on Sunday. The recital started on familiar ground with two works by Rossini: “Addio ai viennesi” and “Mi lagnerò tacendo.” These songs might have fazed other singers as their “warm-up” pieces, but here they were dispatched with relative ease. After the first selection, an ardent “We missed you!” rang out from the upper reaches of the Hall—the evening’s first, and certainly not the last, tribute from his adoring fans. Nemorino’s “Una furtiva lagrima” from Donizetti’s L’elisir d’amore was equal parts ravishing and precious. The end of the aria revealed what was to become something of a reoccurring theme from the singer: a beautifully sculpted, dynamically attentive aria marred by an explosive, loud, crowd-pleasing high note at the end: in this case, a vulgar cadenza that took the singer to a high C.
The real novelty of the first half was the programming of “Ô toi que j’ai chérie”—an alternative aria for Henri from Verdi’s Les Vêpres Siciliennes—and Oronte’s “La mia letizia infondere” and cabaletta “Come poteva un angelo” (one verse only) from the composer’s I Lombardi, which brought the first half to a rousing conclusion. While I found the concert mostly enjoyable, nearly the entire program featured pensive, melancholic apostrophes of love—which might not have been so wearying had not nearly all of them followed a similar vocal trajectory. This was particularly true in the second half of the recital where the repetitiveness of the programming and a sameness of delivery left me somewhat Flórez-fatigued. Massenet’s “Ouvres tes yeux bleus” from Poème d’amour, and “Salut! Demeure chaste et pure” from Gounod’s Faust once again showed an artist fully capable of casting a spell over a song/aria only to see that spell broken by incompatibly loud climaxes. The Faust was particularly egregious with its climatic high C sung fortissimo with no attempt at a diminuendo. Upon reflection, the tenor’s apparent inability to sing any note above the staff at anything other than a forte was the most troubling aspect of the concert. Massenet’s “Ah! Fuyez, douce image” from Manon was the only selection that seemed to stretch the tenor to his vocal limit. The same composer’s “Pourquoi me réveiller” from Werther proved a surprisingly potent interpretation. The concert proper concluded with an unexpectedly successful account of Rodolfo’s “Che gelida manina” from Puccini’s La Boheme. I doubt the tenor will ever go near the full opera, but it is an interesting prospect. I must take a moment to acknowledge the superb work of accompanist Vincenzo Scalera. Whether in his solo contributions,a charming Donizetti’s Waltz for piano in C major and Massenet’s iconic Meditation from Thais(! ), or his attentive collaboration with the evening’s principal singer, the pianist offered a kaleidoscopic and supportive presence. But the story doesn’t end there. Just as I thought I had had enough, the tenor reemerged, guitar in hand, for the first of his seven—yes, seven—encores. What transpired next was in essence a second recital. Shorn of the formality of his printed program, Flórez thrived. His first three self-accompanied encores: “Bésame mucho”, “La flor de la canela” and “Cucurrucucú Paloma” were the highlight of the concert for me. Each piece was responsive, fully alive to text and music, guileless, flirtatious and without artifice. They were the most heartfelt and honest performances of the afternoon. When Flórez next reemerged a gentleman in my row stood up and shouted “Ah mes amis!” The tenor simply made a show of consulting his accompanist before breaking into the cabaletta “Pour mon âme” in a performance that seemed as effortless as when he first performed the role of Tonio at the Met 10 years ago. Each of the aria’s nine high Cs was dispatched with aplomb. Had the concert ended there I suspect everyone would have gone home happy. Yet the Peruvian was not done. Flórez has always had an impish, insouciant twinkle in his eye. It’s what has made his Comte Ory, Count Almaviva and Tonio so endearing. There is a lot of Parma ham in his Peruvian soul. He can somehow deliver schmaltz without being schmaltzy. That combo would prove necessary for his next encore. Plucking a red carnation from a bouquet given to him by a female fan and using the flower as baton, the singer walked that very fine line between sincerity and camp in a version of “Be My Love” that would have made Mario Lanza proud. And honestly, at that point in the recital objectivity went out the window and one completely surrendered to the tenor’s magic. If the inevitable “Granada” did not elicit the expected “no mas!” from me (But, really, no mas!) his “Nessun dorma!”—replete with the audience supplying the off-stage female chorus—seemed the only fitting end to the afternoon. It’s good to have the tenor back in New York. I am eager to see how (if?) the Met will utilize this artist in subsequent seasons. Sunday’s concert revealed the tenor still has much to offer.